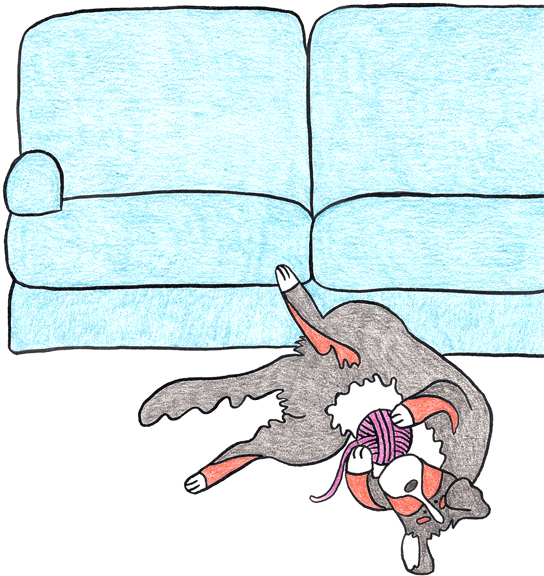 Above: If Cats Were Dogs and Dogs were Cats series by Ruthie Lafond. Why do colored pencils get such a bum rap? I can’t tell you how many times I’ve been told something to the effect of: good stuff, but stay away from colored pencils. It is those same people telling me that colored pencils can be hard to reproduce–but I love using them. As a kid I always drew with colored pencils, maybe because almost every year for Christmas I was given a new set. By the time high school came around I was doing still lifes, mostly of apples! I was lucky enough to be in an after school program for art kids, we had a visiting colored pencil artist come and give us techniques. His pointers (importance of layering colors, how to properly apply pressure) changed my portrait of a llama that I had been working on and my use of the colored pencil forever. I know many children’s book illustrators that work mostly in watercolor or gouache often use a touch of colored pencil for detailing. But what I’m thinking of are the full out amazingly soft illustrations, the result of tirelessly shading with colored pencils. Roslyn Schwartz‘s Mole Sisters could never be as tactile and warm had they been painted. Can you think of other great illustrators who use colored pencils? Are you one of the people against colored pencils and if so, why? I’ve used watercolor, gouache, acrylics, and digital, but nothing feels the same to me as colored pencil. I’d love to know what Peter McCarty’s actual technique is – what paper (or board) and pencils he uses. I wonder how long a single illustration takes him to do. Any serious art director or editor should not be pro or against any specific technique. The only thing that should matter is how one uses that specific technique. Of course this does not apply to colored pencils, which one should never use. Tony Ross did fabulous colored pencil work, check out the book, “I Want A Cat.” And god, I love those Mole sisters. At least, the cover image looks pretty good. I haven’t seen the inside yet. Coloured Pencils are my choice of medium everytime. I cannot get lines or details as fine with any other medium….example piece: http://www.flickr.com/photos/karen_m_berisford/8153863567/in/photostream – Coloured pencils are totally underestimated as a professional medium, but I’ll never cease my passion for them. I saw some amazing colored pencils at the Society of Illustrators Original Art show this year. Hope to do a follow up with more great colored pencil illustrations soon….. Here is a link to an exhibit by the Gainesville Florida CPSA chapter. The artist whose work is shown is Glinda Pennock (http://news.sfcollege.edu/2013/02/07/its-colored-pencil/). After seeing her work, how can anyone doubt the validity of colored pencil as a medium? Holy cow! The technique is flawless so much that you can barely see the scratches of the pencils! When colored pencils are done well they defenitly have a spiritual brightness to them. So beautiful. I like coloured pencils so long as they show character. I love the snowman illustrations but I don’t enjoy the overly realistic looking kind of drawing that resembles nothing more than a photo. Highly skilled yes. Artistic no. Amounts to being very dull and most work I am seeing is photo realistic, its so frustrating. It used to be a simple medium, now it is complex and soulless. People want to remove all of its character and just stuff pigment into all the crevices of the paper. If you want to look at a photo just do so. Art is about expression of the artist just as much as representation of the subject at hand. I’ve just watched someone sharpen away their pencil every couple of minutes in order to get that smooth continuous layer of pigment. Such a waste of very expensive product. Next PostWhy are all my favorite illustrators men?